Ascend to peace of mind in event sales! 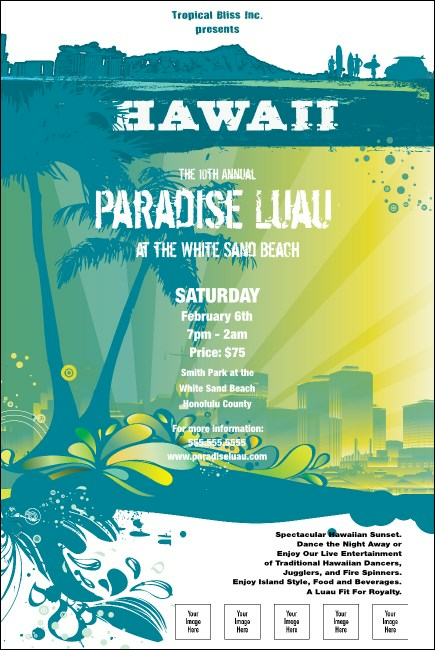 Soar to great heights in publicity coverage with this lovely design from the Aloha State. The Hawaii Poster features a stunning design featuring palm trees, a surfer, water, and other local delights, along with space for you to upload eight of your own custom images to the template. From sea level to the peak of Mauna Kea, TicketPrinting.com covers your environment.